Born in 1965, Mr. Sakurai is a content media producer, an author and a journalist. He is currently involved as cultural exchange spokesman, giving talks in 72 cities in 20 countries and produced fashion shows. 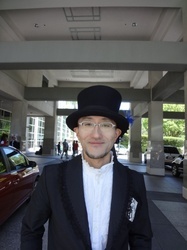 He is one of the first persons to use animation and Harajuku fashion in cultural exchange programs and is often invited as a guest in events about Japan. Mr. Sakurai is most famous as the author of books such as the Anime Bunka Gaiko (Anime Culture Diplomacy) and Sekai Kawaii Kakumei (World Kawaii Revolution), and for taking part in the establishment of "Kawaii Ambassadors" -- three Japanese girls who offer lectures on Japanese fashion at such events as Bangkok's Japan Festa and Paris's Japan Expo.